I’ll be the first to admit that I judge books by their covers. I mean, look at this one–how could I resist? 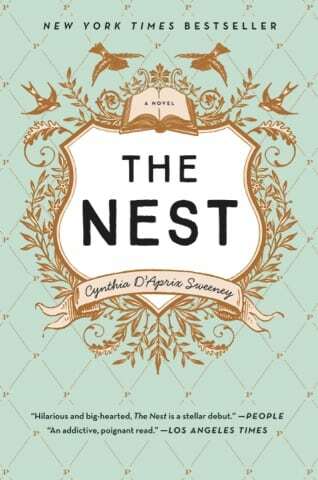 Quick summary: Cynthia D’Aprix Sweeney’s debut novel tells the story of four siblings brought up in New York City with more wealth than class, and not much of either. The Plumbs’ since-deceased father opened a small trust fund for them when they were children; it was meant as a modest midlife boost but exploded, along with the stock market, into an amount that had the power to change the entire course of their lives. Knowing this, the siblings began making unwise (and sometimes secretive) decisions based on the exorbitant sum they expected to come their way. However, when the oldest and least responsible sibling causes a disastrous car wreck on Long Island, the futures the siblings were counting on quickly unravel into chaos. If their brother refuses to take responsibility for somehow re-stocking their trust–“The Nest,” as they had affectionately dubbed it–they’ll all be left with the unfortunate self-inflicted consequences of their years of selfish and irresponsible decisions. Secret after secret is revealed as they come to terms with what in their life has changed and what has not as a result of the accident. 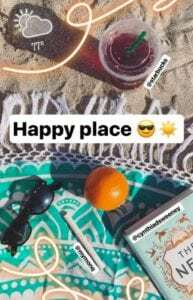 A peek at my Instagram Story, starring The Nest. There was a tremendous amount of character development–in fact, that’s what this work is, mostly–and yet I felt like I never really knew the characters. Or what to make of them. Perhaps Sweeney was trying to paint them in a “human” light, showing that we all have good and bad in us and shouldn’t be blanketed by an end-all assessment, but her equivocating ultimately resulted in confusing, tepid, dissatisfying characters the reader isn’t sure how to handle. There was too much detail in the wrong places and not enough in the right places, and I found the ending to be unsatisfying as well. Overall, a book that’s unchallenging and relatively pleasant to read, but a story that is ambiguous and forgettable. I only gave this book two stars on Goodreads, but I will say that if I had brought this book to entertain me by the pool on some tropical island vacation–or on a plane to/from New York City (the book’s setting)–I probably would not have regretted my decision. Pues sÃ­. Del mismo modo, los hijos de los fallecidos no deberÃ­an de quedarse con las casas de sus difuntos padres. Ãƒâ€°stas deberÃ­an de pasar al dominio pÃºblico, pues su valor ariqetuctÃ³nico tendrÃ¡n. Que las casas de los difuntos se conviertan en museos y universidades para albergar las canciones de los difuntos. Y los bisnietos a la calle que ya pueden trabajar cojones.